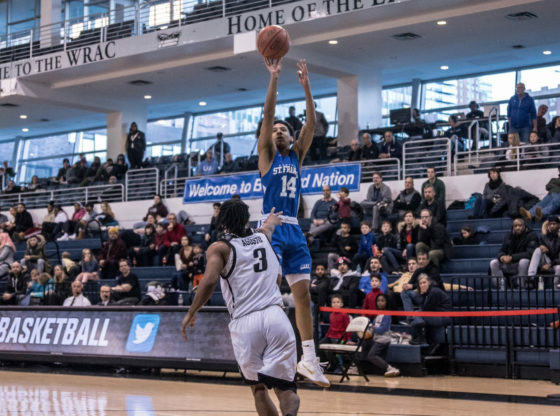 Deniz Celen scored 18 points and Jalen Jordan scored 20 points with four 3’s to help the St. Francis Terriers to a 79-70 victory over the LIU Blackbirds on Monday at Steinberg Wellness Center. The Terriers (12-7, 4-2 NEC) stormed out to a dominating start in jumping to a 13-1 lead in the opening minutes of the game. The team shot hot from the outside in the 1st half, going 58 percent from the field on 17-29 shooting. The Terriers would go 44 percent from the field for the game. Nevertheless, things would start to alter in this game as the Blackbirds (9-9, 3-3 NEC) charged out to a 13-2 run in the opening minutes of the 2nd half, bringing them within a 6 point deficit for a 52-46 score. Raiquan Clark was unstoppable for the Blackbirds in finding a way to drive to the basket continuously. The guard would earn a double-double with 29 points to go along with 14 rebounds. Julian Batts would score 11 points and Tyrn Flowers would score 12 points for the Blackbirds. Glenn Sanabria would score 15 points for the Terriers, but would go 3-12 from the field. Rozel Hurley would finish with 8 points. The win now marks a three game win streak for the Terriers to move up at number 2 in the NEC standings. Up Next: The Terriers will look to extend their win streak to 4 as they travel on the road to face Farleigh Dickinson on January 24th.